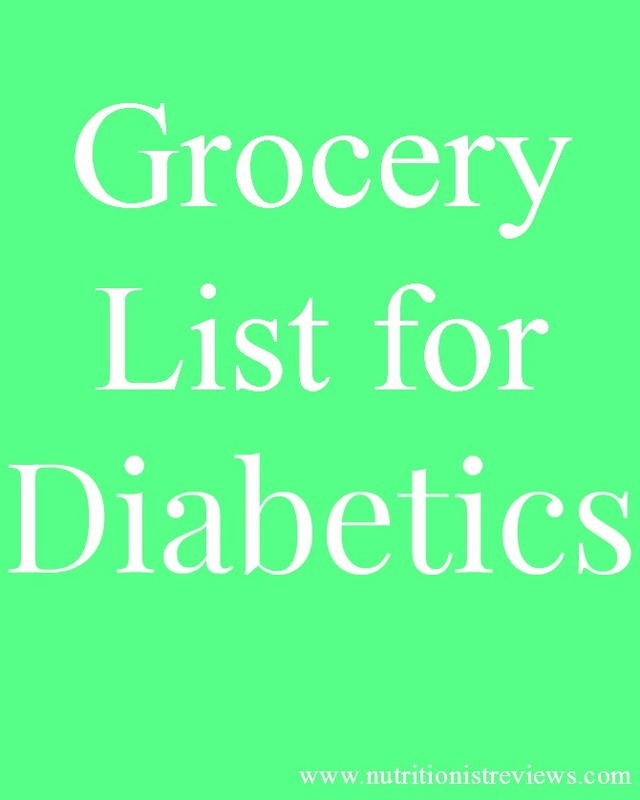 This diabetic friendly grocery list helps make shopping easier for people with diabetes. As a nursing home dietitian, I work with a lot of patients with diabetes. I would say about half of my patients are diabetics. I've been working in long-term care for 6 years now and have quite a bit of experience working with diabetics. I see a lot of misconceptions when it comes to diabetes that I help to clear up on a daily basis. A lot of people believe that diabetics cannot have any carbohydrates- that could not be farther from the truth. 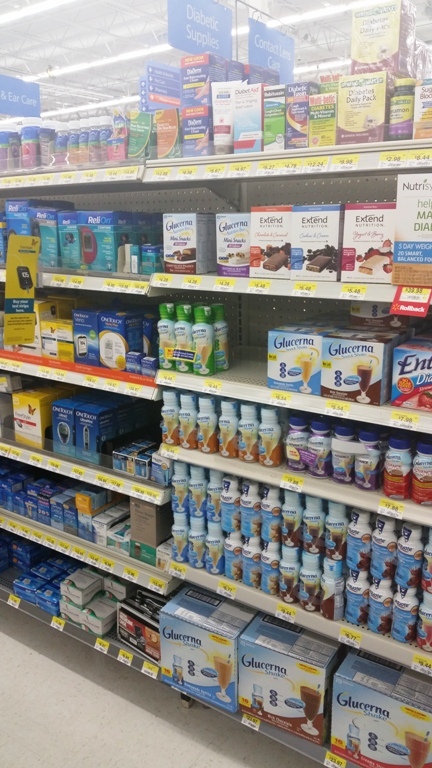 Some people think that diabetics cannot have any sugar- that also is not true. In the nursing home setting, we give diabetics desserts and such with sugar in them but in controlled portions. We also let it be the patient's preference if they have artificial sweeteners instead of sugar to sweeten their coffee for example. 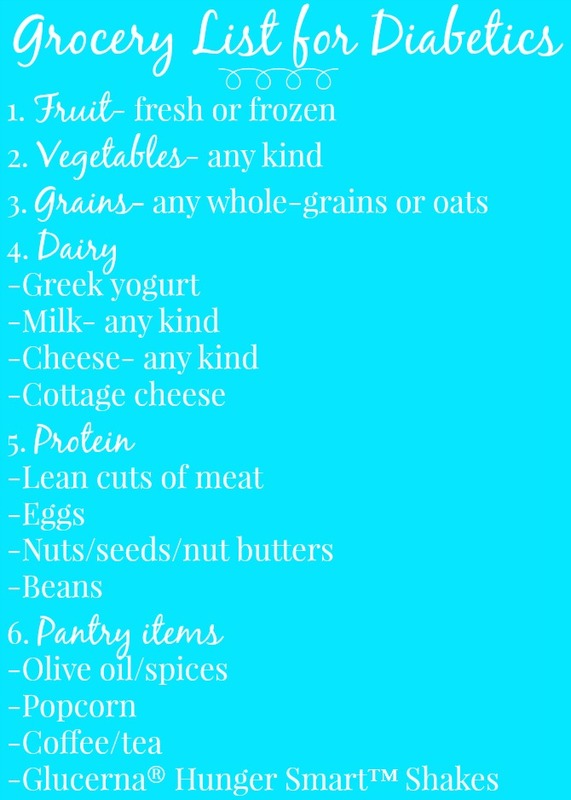 The biggest tip that I give to diabetics is to eat an overall healthy diet. Balance your meals with a mix of whole-grains, protein, fruit, dairy and vegetables. Do not have a ginormous plate of pasta but if you want to have a side of pasta with a chicken breast and broccoli, that would be perfect! -Spices- garlic, onion powder, cinnamon, etc. Glucerna® Hunger Smart™ Shakes make a good snack option for people with diabetes. Each one has 15 grams of protein, 6 grams of sugar and 1 carb choice per bottle. I bought these at Walmart. At my nursing home, we have several people on Glucerna® products if they have a poor appetite, need to gain weight, etc. Use these shakes under medical supervision. When you buy any 2 large packs of Glucerna, you can get up to $3 off using this link. Consult a registered dietitian or your physician for specific recommendations that are tailored to your personal nutritional needs. If you need to carefully count carbohydrates, you may especially want to meet with a dietitian to find out how many carbohydrates are recommended for you each meal.